Richard David Robinson was born May 3, 1941 in Mount Holly. A bright student and gifted athlete, he helped Moorestown High School win a state football championship as a junior, and led the basketball team to state titles as a junior and senior. All three teams went undefeated. Dave was a forward for the Quakers basketball team. He played receiver, defensive lineman and kicker for the football squad. Recruited by Penn State, Dave played both offense and defense for coach Rip Engle from 1960 to 1962. While there he also earned a Civil Engineering degree. It was as a defensive lineman—under the tutelage of assistant Joe Paterno—that Dave truly excelled. He helped the Nittany Lions become a consistent Top 20 team. As a senior in 1962, Dave won numerous awards and was honored as an All-American. In his final game—a loss to Florida in the Gator Bowl—Dave was named MVP. In 1963, Dave was drafted by the Green Bay Packers of the NFL, San Diego Chargers of the AFL and Montreal Alouettes of the CFL. He was leaning toward San Diego for the warm weather. But when he learned that the Chargers planned to trade his rights to the Buffalo Bills, he changed his mind. He knew how cold Buffalo and Montreal were, but never checked out Green Bay. Imagine his surprise to find he was now playing in one of the coldest cities in North America! Dave was big enough to play the line, but Vince Lombardi preferred to play him at linebacker, next to Ray Nitschke. After one year as a back-up, he got into starting lineup in 1964 and proved to be a huge difference-maker. Dave was strong enough to bang with tight ends at the line, and fast enough to stay with them in coverage. During his career he would tally 27 interceptions—21 with Green Bay. On running plays, Dave proved too quick to block on certain plays, nullifying whole sections of the playbook for teams playing the Packers. Dave also was a good pass-rusher, with his long arms and quick reactions. He batted down countless passes during his career. In the 1966 NFL title game, he dogged Dallas quarterback Don Meredith into throwing a game-ending interception in the Packers’ end zone. 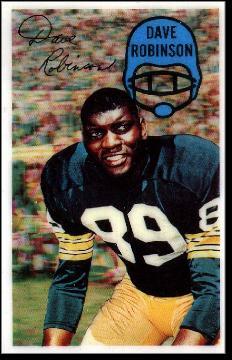 Along with Nistchke and Lee Roy Caffey, Dave formed one of the top linebacking trios in the NFL during the late 1960s. The Packers won three straight NFL Championships from 1965 to 1967, as well as the first two Super Bowls. As the team aged in the late 1960s, Dave came into his own, earning All–Pro honors in 1968 and 1969. The Packers traded Dave to the Washington Redskins after the 1972 season. He played two more years. When Dave began his pro career, he was one of the league’s biggest linebackers. By the mid-1970s, he was one of the smallest. He was one of the pioneering players who had proved that a “big man” could play they position. During his playing career, Dave had worked as an engineer for Campbell Soup in New Jersey and Schlitz in Wisconsin during the off-seasons. He went to work full-time for Schlitz after retiring from the NFL. In his spare time he competed in chess and bridge tournaments. Dave was inducted into the College Football Hall of Fame and named as a linebacker on the NFL’s All-Decade Team for the 1960s.